The First United Methodist Church of Cedartown, Georgia has a history written by the lives of dedicated people who have been inspired and led by God to establish not just buildings but a living community of believers for God’s glory. While many of these individuals are known and their acts of faithfulness recorded, many others have lived and are living, lives exemplifying Christ and glorifying God, but their influence exists in the minds and hearts of these whose lives have been touched and enriched by them. The earliest evidence of Methodism in and around Cedartown is found in this account by Jeannie O. Crabb in the October issue of the 1953 Cedartown Standard. “…the first preachers who ever preached on this soil we now call Cedartown were of the Methodist faith 160 years ago. Two brothers named Nicholas and Hardin Scales whose families were Baptist lived near Nashville near the Hermitage, Andrew Jackson’s home. These men had heard about the great revival of religion that was sweeping the country through the preaching of John and Charles Wesley at Savannah. These brothers were eager to hear the Wesleys preach, so their father gave them each a horse, saddle bags, and some money. They traveled to Savannah and after hearing John and Charles Wesley, were converted to the Methodist faith. They sold their horses, gave their money to help carry on the great revival, took their staffs and were told to preach to the Indians and settlers on their way home, which they did. They came back through Cedar Valley and gathered together the Indians at the Big Spring in what was afterwards known as Cedartown and preached Jesus Christ to these Indians as they had heard the Wesleys preach. Years later when a very old man Hardin Sales visited in the home of his heirs, the mother of Mrs. Bradford, Mrs. Dodds and Mr. Walker, related having had this experience and expressed a desire to visit the spot where he had preached to the Indians years ago. He was brought here to our Big Spring. He said “This is the spring where we preached to the Indians before reaching our home years ago. In 1849, when Daniel C. Roberts came to “Cedar Town” from North Carolina, there was not an organized Methodist church here. He, with his wife and his wife’s sister, together with Professor Ben Mosely and his wife, met in a small log storehouse and formulated plans for the organization of a Methodist Church. The Cedartown Methodist Church was organized in 1850 in this same log house which served as the meeting house, the first meeting house. It stood near the corner of what is now College Street and Wissahickon Avenue, where later Mr. Will Trawick’s residence was located and where now stands the First Baptist Church. Constituting the original membership were the following: Mr. & Mrs. Daniel Roberts, Miss Mary Witcher, Professor & Mrs. Ben Mosely, Miss Annie Byrd, Re. Elija Byrd, and Mrs. Odessa Byrd. They secured a minister and had services once a month at the old Mosely School House on the Cave Spring Road, about a mile and a quarter from town. Later Asa Prior donated some land and logs to build a church on Spring Branch near where the Blue Spring is located. This house was used for a school house during the week and for a house of worship on Saturday and Sunday. Before a great while the accommodations of this building were inadequate, for by this time a number of families had moved into this community, namely: The Wimberly, Websters, Charleses, and Peeks. In about the Year 1852, these devout citizens merged with the earlier membership into the Methodist Episcopal Church and built a meeting house on an acre of land situated on what is now North Main Street, where North Philpot comes into Main Street. This one room building was of frame structure with plain windows. It served also as a school house. The significance of the selection of this site is explained in a piece from Ms. Crabbe’s 1953 history. This spot selected was where Aunt Annie Byrd and her family camped for the night when they were traveling from Dekalb County, Georgia to visit the daughter of Aunt Annie Byrd and Rev. Elija Byrd, who was living at the time in Summerville, Walker County, Georgia. The Byrds subsequently purchased land and made their home at Lake Creek about five miles north of Cedartown. As was her custom, Aunt Annie Byrd, this Saintly Mother of Israel, knelt by a large tree and prayed that God would erect a Methodist Church on that spot. The Church grew and succeeded in meeting the needs of its members is explained by the following edited selection from the previous history beginning with 1856. During the latter part of 1856, the Church asked the Annual Conference to make Cedartown a station. This was done with Rev. J.W. Trawick serving here during 1859-1860. During the war years, it was combined with Cave Spring and made a half station. In 1872-1873, it was merged into the Cedartown-Van Wert Circuit, and in 1874, it was made a full station. In 1871, the Church and land was sold to William Peek, father of the late Captain Julius A. Peek. He purchased the old building for the sum of $1,000.00 and donated it to the black people for their house of worship. The proceeds were invested in the construction of the more commodious and up-to-date brick building on College Street. This new building was just a straight four walled building with two flights of steps and two doors in front. Through the center of the house was a partition which separated the men’s side from the ladies’ side. The first Sunday School was organized by Mrs. Harriet Huntinton Noyes. The Missionary Society of the Church was organized in 1877. When the Church was re-modeled in 1887, the wings and vestibule were added, the windows changed, and frosted glass used. The choir loft was built later and stained glass windows added. The first parsonage was built in 1877. Rev. W.D. Anderson was pastor at that time. The second parsonage was built on College Street in 1908 and was renovated in 1949. The Sunday School Annex was begun during the pastorate of the Rev. Frank Quillian and was completed in 1924. “Notes on Church after ‘25” by (MB??) include insight into the times and the feelings during these times. The completion of the Educational Building as a deep sorrow to many faithful, loyal members because the plan previously formulated and approved by the Church was for the Sunday school Building to be completed first and then work to begin on the sanctuary. While plans were completed, there came, however, a strong, if silent, opposition to more fund raising at this time. The cost of labor and material was high, and the cry of depression was raised. Of course, the Depression did come and lowered costs but it also lowered income so that there was not even a movement toward building. The sanctuary walls were considered unsafe, and some work was done on them, but for a number of years, the building has no money spent on it. Then in the early thirties Number Five Circle of the WSCS took as their special project the renovation of the parsonage, a sorely needed task. Each improvement, however, called for another. By the time the work was completed, the entire church and nearly every citizen in town had assisted in raising the splendid achievement of seven thousand dollars. Afterwards, the three ministers preceding Mr. Stone urged that the campaign for a new church be pushed. Some donations were made, some bonds bought, and funds crept slowly upward. Yet, as business, population, and urging grew, so did the cost of materials and labor. Finally, in 1952, the time was right and the people of the church were finally ready and willing. Amazingly, the First Methodist church of Cedartown raised more than $122,000 in six days in donations and pledges. Due to the consecrated efforts of the pastor, Mr. Roger Stone, and the Building Committee, as well as loyal members and a supportive community, this monumental effort was solidified by the laying of the cornerstone on May 10, 1954, by Bishop Arthur Moore. The morning worship service by Bishop Moore on November 14, 1954 in the new sanctuary was the realization of dreams and hard work. Also, amazingly, all debts on the property were cleared in three years time and on November 10, 1957, Bishop Arthur Moore was again present for the dedication service. The Church of Cedartown, as well as other churches in the Rome District was under the leadership of District Superintendent J. Hamby Barton during the years 1954-1958. Mr. Stovall Trawick recalled that Mr. Stone prayed each morning with the workers as they built the new church, and that he spent much time at the construction site. Mr. Trawick’s memories of the old church coincide with those of Miss Sarah Huff, whose edited speech follows and fondly recalls the old church. Have any of you ever noticed that some of the windows in our church do not match the others? There are two which are different, one of the east side and on the west, in the front part. They are from the old church which stood where our present building is located. These windows were saved when the old church could not well serve our members and they were put in the new building to remind us of our old church which we loved so much. The old church had served for many, many years but it lacked many things we needed. For one thing, it had no restrooms, in fact no water at all, so when anyone was to be baptized water had to be brought for the little silver baptismal bowl which was used. Now we have a stand which contains a baptismal bowl or “font”, as it is called. It is just inside the altar rail, on the left, and was given in honor of Bobby Hamrick, Mrs. Mary Hamrick’s son who died of an accident when he was sixteen years old. The old church was built as a rectangular building and when more space was needed a wing was added on each side. The windows were stained glass and very beautiful, but they did not have any emblems like our present windows (like the cross, the Lamb, the Ten Commandments, etc.) and the ones at each side of the main section were hinged in the middle so the warm air could go out and the top and cooler air come in at the lower part, for summer time use as no one had ever heard of air conditioning. There were ceiling fans, and paper or palm leaf fans in each pew to help folks keep cool in the summer. In the winter time, the building was warmed by a coal furnace in the basement, with hot air vents in the floors, covered with metal grills. In the vestibule, a long rope hung from the bell in the steeple, and on Sunday mornings the bell rang out to tell us it was time for Sunday school. This same bell is now to the side of the Church restored to ring out the Good News. There was no separate Sunday school building, so we all met in the church, with classes in different sections. For the small children, there was a small space on each side at the front, with a railing like the altar railing around it, and little chairs for the children. Miss Mary Langford taught one class for small children, and Miss Della Russell, a public school teacher, taught the one on the opposite side. One of the earliest things I can remember is my mother getting me ready for Sunday school and bringing me to church and prayer meting. When I was about nine years old, I felt I understood enough about how much Jesus loved me and I joined the church. There were several others who joined with me. Mrs. Phil Brewster was one of the group. I have lived in Atlanta and in Savannah since that time and have had my membership transferred at those times, but when I returned to Cedartown to live, I had my membership transferred back here. There was a small choir loft in the old church, behind the pulpit and what do you suppose furnished the music? A small organ which had to be pumped by the organist who was Mrs. W.H. (Julia) Trawick, the mother of Mrs. Elsie Trawick’s husband. There was also a piano which was used whenever there was no one present to play the organ. The piano in our church now was given in honor of Mrs. Julia Trawick’s memory. At a time of growth in membership with the completion of the new sanctuary, the Church continued its acts of faith to meet its needs. In October, 1958, the Church purchased the Willingham property which adjoins the church grounds on the south, consisting of a lot fronting on College Street and extending westward to Bradford Street, together with two houses and a garage. Rev. Arthur Gilmore was pastor at the time. The house on College Street was used to further the Christian Education program of the church; it was used as a meeting place for several church school classes and as a youth center. In the summer of 1962, the house at 109 Bradford Street was furnished and became the residence for future Educational Assistants (or Directors of Christian Education) of the First Methodist Church. Rev. and Mrs. Larry Green were the first to occupy it. In 1963, during the pastorate of Rev. 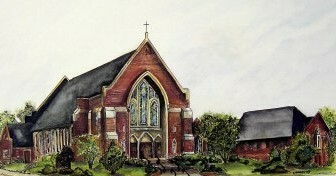 Douglas Gibson, the Church bought the property of Mrs. George Vance which adjoined the church grounds on College Street. The house on this lot continued to be known as “The Vance House” and became the meeting place for classes in the Church School Youth Division. It was also used as a Youth Center. The house on the Willingham property was torn down in 1964, and this area was used for outdoor recreation and parking. The Church was growing and more church school space was badly needed. In April, 1963, two committees were appointed: the Building Committee to develop plans for a new education building, and the Building Fund Committee to plan a financial campaign. The architects were selected in 1964. A Building Fund Crusade was conducted and construction was begun in the fall of 1966. Rev. Ralph Hawkins, minister at this time, was instrumental in making this dream become a reality. On September 10, 1967, the new Educational Building was consecrated by the Rev. Dumas Shelnutt, District Superintendent. The Church was especially proud of the fact that one of its own young people had decided to enter the ministry. On October 6, 1965, John Cowan, son of Mr. & Mrs. Sam Cowan, was recommended by the Quarterly Conference for a license to preach. On April 23, 1968, history was made in Dallas, Texas that affected the First Methodist Church of Cedartown. On this date, the Plan of Union was made effective between the Evangelical United Brethren Church and the Methodist Church. The name of the “new church for a new world” was The United Methodist Church. Thereafter, the local congregation became known as the First United Methodist Church of Cedartown. The previous history explains that the minister’s home was eventually considered and the needs of the old parsonage were examined. In the summer of 1968, the purchase of a new parsonage was deemed necessary in light of extensive costly repairs needed to the existing one. The Church purchased the home of Mr. & Mrs. Olin Gammage, 235 Lakeside Drive; Rev. Jim Winn and his family were the first to occupy it. A Stewardship Crusade was conducted in the fall of 1968 and pledges of almost $125,000 were received toward budget and building purposes. The following year, the Church so richly blessed itself assumed a basic share of the salary support for a missionary family in Liberia. For the first time, we had our own missionaries, the Reverend and Mrs. Paul Sundar. Through the seventies, the Church helped its own and in faith once again undertook to provide for its needs. The following article from the September 24, 1981, Cedartown Standard pays tribute to the old Sunday school building which was demolished to provide room for the two story addition to the 1967 Educational Building. This addition provides office space, meeting rooms, a modern kitchen, and fellowship/recreation hall. The newspaper reprinted the article from the weekly church Messenger. “It’s gone – smashed by a 3 ton steel ball. In less than a week, its walls were reduced to a splintery mass of rubble. Time, also had taken its toll. The old building had stood proudly for 57 years and served far beyond its call of duty. Yes, it’s gone – the walls, the brick, the mortar but the memories! Ah! Where are the memories?! They are in hearts scattered to the four corners of the world from Saudi Arabia to Argentina – from Guatemala to Germany – from Hollywood to Esom Hill. What are the memories?! Each memory is as unique as each person remembers – Miss Della’s box of candy; Miss Artie’s rocking chair, Miss Susie’s Bible stories, the hearty singing of The Men’s Bible Class. The fellowship of yea thousands of dinners. The hot, sweaty days of Vacation Church School. The old walls heard the patter of little feet that later walked many roads of like – doctors, lawyers, ministers, generals, mothers. From battlefields to school rooms – from football fields to classrooms – from offices to homes. The halls knew the footsteps of the Saints, the near Saints and anything but Saints. Yes, it will take more than a 3 ton steel ball to smash the memories of learning “Jesus Loves Me”, hearing the stories of David and Goliath, and The Babe in a Manger. Farewell, old building a bit of you will always be a part of us – wherever we are. This article was written by me. Edith L. Harpe. It was first printed in our church Messenger – I requested no signature. No history ends, for events constantly occur and people live and believe and serve and pass on to others their faith and their duties. The history of the First United Methodist Church of Cedartown continues throughout its second century and beyond.